If there's one thing VR game developers need right now, it's player feedback. 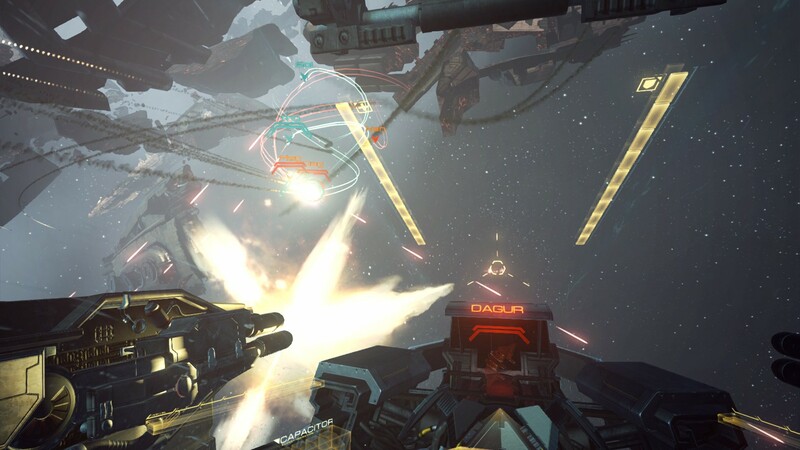 That's why CCP Games, whose game EVE: Valkyrie is set to be a launch title for both the Oculus Rift and Sony's Project Morpheus, has been revealing build after build of the game for EVE players, Oculus fans and the press to play. And talk about. And gripe. And help. These are the challenges that CCP Games has faced over the past two years, which VR-specific problems it's solved, and which the ones it's still wrangling with. The decades old method of simply placing UI elements in the corners or top and bottom edges of the screen simply doesn't cut it in VR. For a start, if you're wearing a decent enough headset, there should be no corners or edges. And game designers don't want to obscure your view of either the cockpit, in this case, or enemies. The poor souls can't even resort to accessing 2D menus in-game as that would spoil all the immersion they've worked so hard to create. Audio helps - your pilot in EVE: Valkyrie receives instructions from the protagonist Ran. So in the single player, tutorial missions, instead of an arrow pointing you back towards where you should be flying in space, Ran will shout, "What are you doing pilot?" CCP's clever attempts at creating virtual spaces to act as 3D menus are still a work in progress. When you die in the multiplayer mission, you are transported into a clone vac room and in order to select a different ship from your starter Wraith, you must tilt your head to the right before hitting your controller. But we're just not used to navigating menus like that. "A lot of people have struggled with those ship selects using your head," said executive producer Owen O'Brien at a Valkyrie panel at EVE FanFest. "People aren't so used to using the head as a cursor, if that's the first time you've used it. But that's something we tried to communicate that's possible in VR: looking around the room." We are so desensitised to dying in video games that the first time you die in virtual reality, it might come as a bit of a shock. Most designers use a fade to black - you can't often see an avatar of your body anyway so why show it being decapitated or blown up or shot? EVE: Valkyrie's team threw out a lot of ideas - including your corpse being sucked out of the cockpit in front of you - before landing on the current, much more subtle iteration: a blasted up cockpit, cracked glass and withered equipment before fading. "There's a lot of things that sound amazing in theory but in VR they're just horrible," said 3D artist and VR experience designer Andrew Robinson. "Maybe once it would be fine but continuously, just death after death after death." That said, when a player suggests being able to see the wreck of your previous ship and body as you move around space, the designers furiously scribble the idea down in their notebooks. Even blanking out the whole field of view with flashbangs or stun grenades had to "really be toned down" according to O'Brien. The team stressed that when it's not just a computer game on a screen in front of you, it's your entire experience, what you might have found thrilling in gaming, now becomes unpleasant. Instead is playing around with fog effect densities to allow players to experience flying around in low visibility. This is a biggie in VR and while each iteration of the headsets is lessening this problem and, of course, it affects gamers differently, from CCP's perspective it's all about being in control. Tom Farrer, game design director on CCP's Samsung Gear VR game Project Nemesis, notes that his team has tried to plan waves of incoming attacks so that for instance you don't suddenly have to jolt your head from the far left to the far right too much. In Nemesis, you're in a fixed position, too, which really minimises feelings of motion sickness. And in Valkyrie, the designers have put ideas of a co-pilot or autopilot mode on the back burner, at least for the fast-paced missions built so far. "If you are being moved by something that you're not in control of, it would induce simulation sickness very quickly," explained O'Brien. "So if you imagine a rear gunner, you'd be moving backwards without controlling it. You'd need a very strong constitution I would say. However, I'm not ruling it out. We have plans to go back and look at two player and see if there's a way we could have that. It could be on a larger, slower ship that's making less dramatic moves, that's where we're going." VR is perfect for first person shooters, everyone cried. And then they contemplated the price-tag on a Virtuix Omni treadmill to let you actually walk around while playing an FPS in VR. Exactly. The seated cockpit set-up of EVE: Valkyrie lends itself to sitting down with a controller or joystick as well as allowing the designers to explore the EVE universe through the eyes of a pilot. But with CCP's Atlanta offices experimenting with Kinect 2 and Oculus Rift set-ups, the Valkyrie team has been tempting into hypothesising over future controls. "When we took EVE-VR to E3 and [Oculus founder] Palmer Luckey played it," said Robinson. "He instantly jumped up and said 'I'm going to build an cockpit around my desk with all these bits and pieces around it'. "And I really wanted to build a large cardboard cockpit you could sit in and move UI stuff around. VR mirrors so much of your real life experience and where your focus is. We built something out of cardboard boxes in the office and it kinda worked." Deaths, motion sickness, virtual menus - this is new territory for game designers, 3D artists and developers and the games and demos we've played so far still have a way to go. But just think about the payoff when they get it right. What issues have you had with VR games and experiences? Do you get simulation sickness? Would you want to see yourself die in-game? Let us know in the comments.